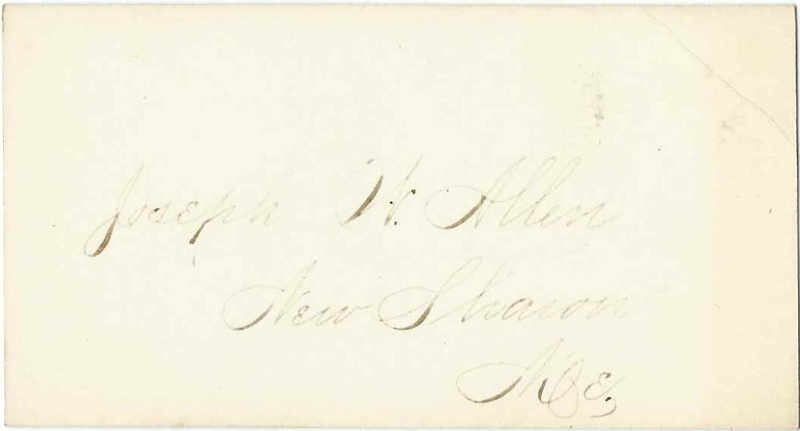 Calling card of Joseph Warren Allen of New Sharon, Maine. calling card of Sylvia C. Lakin, presumably the Sylvia C. Lakin who would marry Joseph's brother Benjamin Franklin Allen. Joseph Warren Allen was born July 9, 1865 at New Sharon, Maine, the son of Benjamin Allen and Eliza A. (Coombs) Allen. On July 7, 1889, Joseph married Henrietta Smith, daughter of Quinton L. Smith and Frances A. (Rundlette) Smith of Mount Vernon, Maine. Joseph and Henrietta made their home at Mount Vernon, Maine, where Joseph was a grocer with his brother Benjamin Franklin Allen. Joseph and Henrietta had, I think, four children. Joseph died in 1930 and Henrietta in 1938; they're buried in the Fairview Cemetery at Farmington, Maine, with at least two of their children. If you have corrections and/or additions to the information above, or if you feel that Joseph W. Allen was another person, please leave a comment or contact me directly.